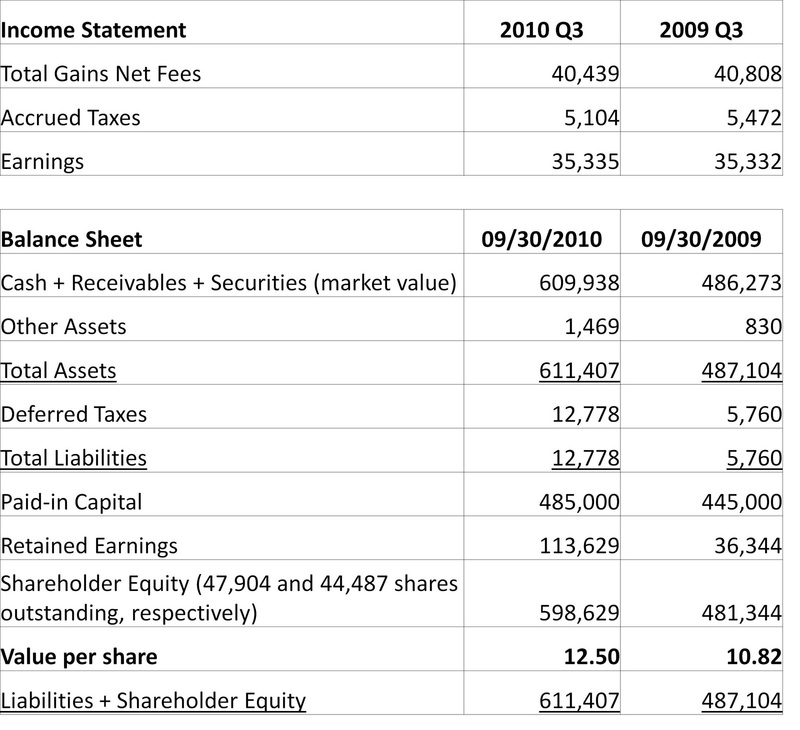 For the third quarter ended September 30th, 2010, KVF earned $0.74 per share, bringing the value of each share to $12.50. 2) The fund benefited from its position in Blonder Tongue Labs (BDR). More details on this are available here. 3) The fund benefited from its position in Nu Horizons (NUHC). More details on this are available here. The news was not all positive, however, as some of the fund's positions decreased in price. In many cases, this was seen as an opportunity to increase fund positions at what are believed to be even more attractive prices. Hopefully, these investments lay the groundwork for strong returns in future periods. Another negative for returns this quarter was the currency exchange rate between Canada and the US. Had the USD/CAD exchange rate finished the quarter at the same level at which it started the quarter, earnings would have been $0.23 higher than they were. Currency volatility is likely to continue to have a significant bearing on short-term, quarterly results. However, over the long-term, currency volatility is not expected to be a material factor in the fund's overall performance. For this reason, the fund employs no hedging positions despite the short-term volatility that has been and likely will continue to be experienced by the fund. by the way, what do you charge for the fund? I've looked through the fund information and I can't seem to find it. 1) Wouldn't it make more sense to post your fund's performance in a more conventional fashion, such as tracking per-share NAV over time? Your reporting method seems more appropriate for an operating business rather than an investment business. 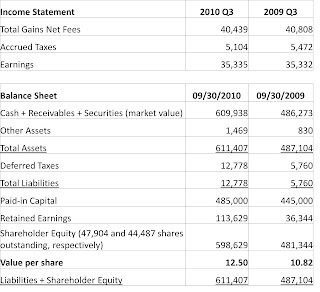 For example, the income comparison with the same quarter last year is of questionable value. 2) Do the new investors get in to your fund at a price that takes into account the deferred tax liability? That would appear to make sense, but I know that's not how mutual funds work in the US; new investors are forced to absorb the deferred tax liabilities of the existing investors. I wish I could, Epic. Unfortunately, regulatory barriers are high in this business. 1) I agree the income comparison to last year is not that useful, but it doesn't hurt either. The value per share that is published basically IS the NAV you refer to, however. 2) Yeah the NAV (which is what new shares are purchased at) is lower by an amount of deferred taxes that takes into account the fact that shares have appreciated. You can see that on the balance sheet as liability which gets subtracted from the assets to arrive at the shareholder equity amount. I agree that the per-share Book Value you report is the same as (after-tax) NAV, but the issue is that you don't have any charts or tables that show how your fund has performed in comparison to, for example, the S&P 500 (or whatever index you think is appropriate). That's really what most investors care about. I think it would also be useful to track pre-tax NAV (i.e., disregarding deferred tax liability) - that's how most mutual funds and hedge funds report their results. Yes I have had that request in the past. However, this fund has a long-term focus, far longer than that of the "industry". As such, short-term comparisons (the fund is barely a year old) are not appropriate at this time. In the future, however, after a few years that is, such comparisons would be appropriate, I agree. I didn't see anything about the fees that you charge. Is that not public information? No fees at this point. It's mostly my money anyway, since I can't sell to the public. Great job on the blog and fund. Keep up the good work. I'm curious as to what type of structure you've set up this fund as. I'm thinking of setting up a private fund as well to help invest money for close family and friends, however, I'm not sure which structure is appropriate and most cost-effective for this. (ex. corporation, partnership) Also, would there be regulations for setting up something like this, even though the fund's "units" are not being sold to the public? Thanks, Michael! Regarding your question about how to set it up legally, it really depends on your jurisdiction, as there are different rules everywhere. I spent some time talking to lawyers and reading a lot of documentation before I got started, so I would encourage you to do the same.